If George Washington had fallen in battle, would the limping former Quaker Nathanael Greene have been the father of our country? The American mythos is marked with celebration of the great acts of ordinary individuals. The leaders of the American Revolution are often portrayed as heroic figures fighting together in the name of liberty. 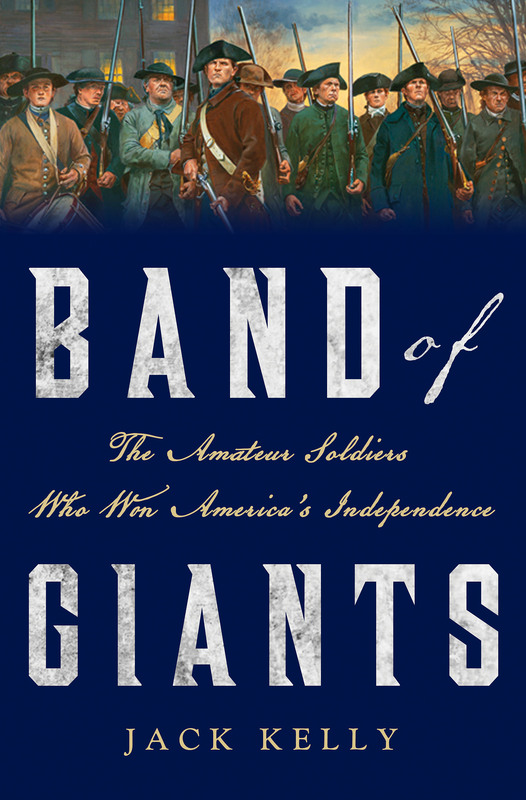 Band of Giants, The Amateur Soldiers Who Won America’s Independence by Jack Kelly is a fast paced account of early American leaders from the French and Indian War to the Treaty of Paris, 1783. Kelly uses a unique blend of personal accounts and military strategy to engage the reader and reveal the lives of military leaders in the late 18th century. If the American Revolution serves as the origin story for America’s early leaders, Jack Kelly is going to introduce them to you in a whole new way. Band of Giants offers the reader as chance to follow the Continental Army into battle. You can march with Benedict Arnold into Canada and learn about Knox’s rescue of cannon for the Colonists. This book is a chance to get inside the head of America’s first military leaders. Kelly helps you get to know the leaders of American forces and their challenges as he mixes military maneuvers with excerpts from correspondence. What led Henry Knox and Nathaniel Greene to choose to go to war? How did untested soldiers learn the practice of war? What did George Washington know of war? In Band of Giants, you can come to know George Washington as a general. Learn of his early experience in the Ohio territory. How did he emerge as a leader in the Revolution? With careful research, Kelly reveals Washington’s growth as a leader and internal struggle during the war. Jack Kelly illustrates the relationships Washington has with key figures in the American Revolution that shape the course of the war. The strife with Charles Lee and the betrayal of Benedict Arnold strain Washington’s reserves. Yet, he draws strength from the support of the Marquis de Lafayette. Jack Kelly gives the reader insight into to circumstances that influenced many of America’s military leaders. Military leaders whose names dot the American landscape like Lafayette, DeKalb, and Greene emerge from the page as historical figures. Carefully woven prose makes clear the vital support America received from abroad and the risk is commanders faced on the front. Who helped the Continental Army? What risks did they take? Delve into the mind of the young Marquis de Lafayette who risks his life and wealth in support of liberty during the American Revolution. Kelly clearly connects the contributions of men like Baron von Steuben to the success of the Continental Army. Take the opportunity to read Band of Giants and dig into the lives of ordinary men who helped fight for American independence. See leaders of the American Revolution as you never have before. Of course not all were amateurs. George Washington, who almost single-handedly started the French and Indian War, was battle-tested previously — as were Horatio Gates, Daniel Morgan and Charles Lee. They had all participated in the disastrous “Braddock’s March” to Fort Duquesne in 1755 and survived. (In fact Washington had wanted a commission in the British Army; when he realized he’d never get it he quit the militia in 1758, well before the War was over.) Others had had military experience in Europe, including Baron von Steuben. By and large, however, almost everyone on the American side had never seen combat or even soldiered. Two of Washington’s most capable generals, Nathanael Greene and Henry Knox, learned everything they knew about military science from books. Henry (“Light-Horse Harry”) Lee, father of Robert E. Lee, was pursuing a legal career when the American Revolution broke out. Lord Stirling, a New York colonist who styled himself a nobleman, was a wealthy socialite. “Mad Anthony” Wayne was a surveyor from Pennsylvania. Daniel Morgan recognized that [British General Simon] Fraser was stiffening the resistance in front of his riflemen. According to an often repeated story, he ordered an illiterate young Pennsylvania sergeant named Timothy Murphy to kill the scarlet-clad general. … He fired a ball into Fraser’s stomach. As the general slumped, the British position began to crumble. The loss of Fraser “helped to turn the fate of the day,” a British officer later admitted. American artillery captain John Henry, the twenty-year-old son of Virginia governor Patrick Henry, had distinguished himself in battle. After the cataclysm died down, he wandered the field, staring at the faces, the blue lips, dead staring eyes and glistening teeth, of men he had known. The sight unhinged him. He broke his sword in half and went “raving mad.” He disappeared for months and never fought again.